The Easter Holidays are upon us, how did that happen? 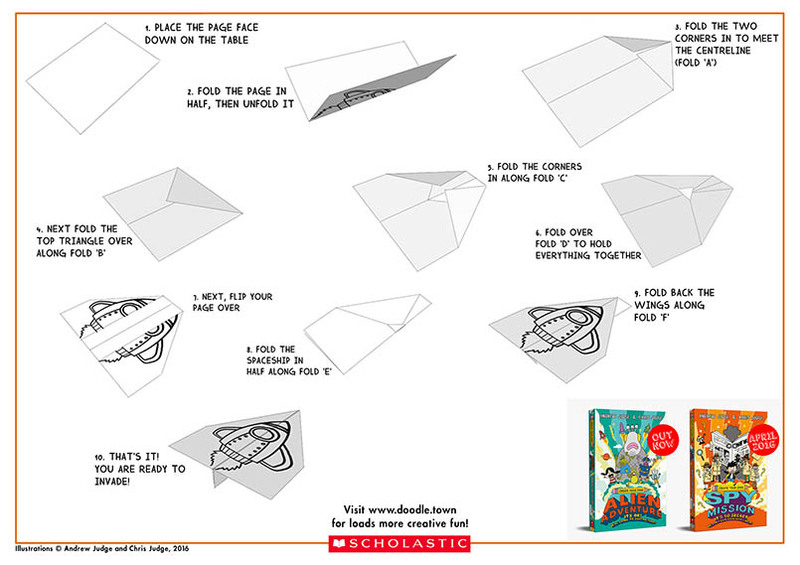 So we asked our friends at Scholastic for their top tips on how to make some fun this Easter! So here are some top tips from the Create Your Own master himself Andrew Judge, author of Create Your Own Alien Adventure and Create Your Own Spy Mission. Kids and bad weather over Easter break is a challenge … and that’s where we come in! Time off means your kids will have friends, siblings and YOU to play with. TV and video games can fill the gaps but face-to-face creative play is where the real fun is at. Pull out the paper stash, some pencils and markers, a six-sided dice and get CREATIVE. Drawing and colouring are always good standbys, but drawing and colouring with a purpose is always more fun. Divide your page into 6 or 8 panels, come up with a funny title, and off you go. Or use your dice and our useful Random Comic Generator to get started. 1. goes sailing in a storm. 2. takes part in a motor race. 3. discovers a treasure map. 4. takes a rocket to the moon. 6. finds a magic guitar. Always fun, paper airplanes give kids something to make, decorate and play with. There are lots of instructions and printable templates to be found on the web. Our own website www.doodle.town has a whole alien invasion fleet to print, colour and fold. 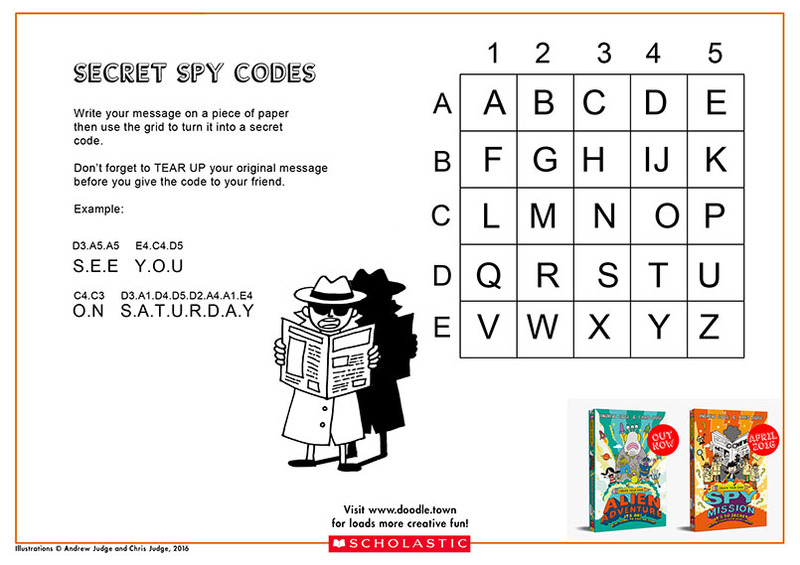 Secret messages are a great way to create challenging and fun puzzles. There are lots of different codes out there, but this grid code is also a great way to teach coordinates. You can leave messages for each other around the house, under pillows, on the fridge door, or in a child’s lunchbox. The letters in this grid are in alphabetical order, but there is no reason that they should be, particularly for older kids. Click here for the full sized sheet. You can play this game with any number of kids or adults, a sheet of paper each, and a dice. Each player rolls the dice. The first person to get a 6 starts. 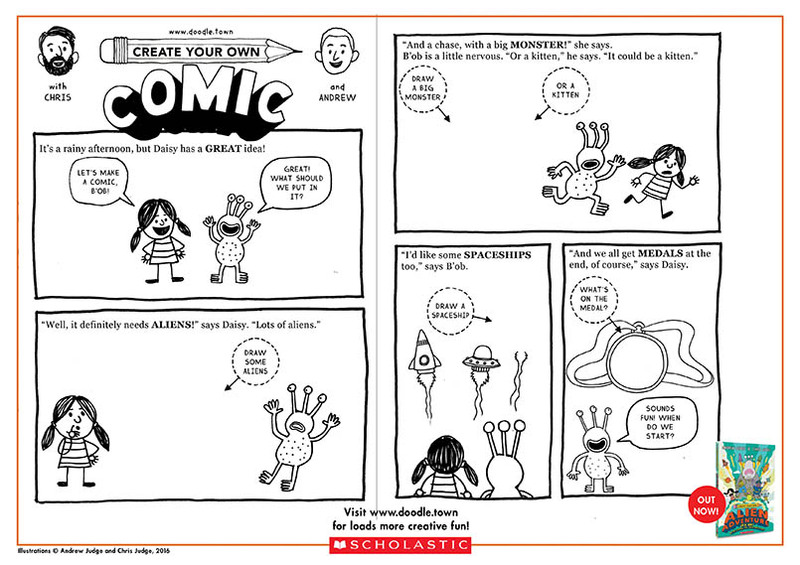 The aim is to be the first player to complete your drawing of B’ob the Alien (or any creature or animal you prefer). Everyone then takes turns rolling the dice. Create Your Own Alien Adventure by Chris Judge & Andrew Judge is out now in all bookshops and online. Create Your Own Spy Mission is out on 7 April 2016. Download comic templates, paper planes, colouring pages, and other activity sheets at www.doodle.town.